If you’re looking for someone to replace Roger Goodell as NFL commissioner, and let’s face it, you are, then we just might have found the guy. Scott Smith, the superintendent of a school district in Louisiana, says his players will stand for the anthem, or there will be consequences. Smith, the superintendent for Bossier Parish in Louisiana, said that students should “expect to stand in solidarity when the national anthem is played at sporting events,” according to Fox News. “In Bossier Parish, we believe when a student chooses to join and participate on a team, the players and coaches should stand when our National Anthem is played in a show of respect,” the superintendent said in a statement. Smith did not specifically state what punishment might be meted out, only that school principals would have the discretion to determine what consequences students might face. However, Parkway High, a school in the Bossier Parish district, did send parents and students a letter to inform them of what the consequences would be for violations. Naturally, the ACLU slammed the school district for its announcement. 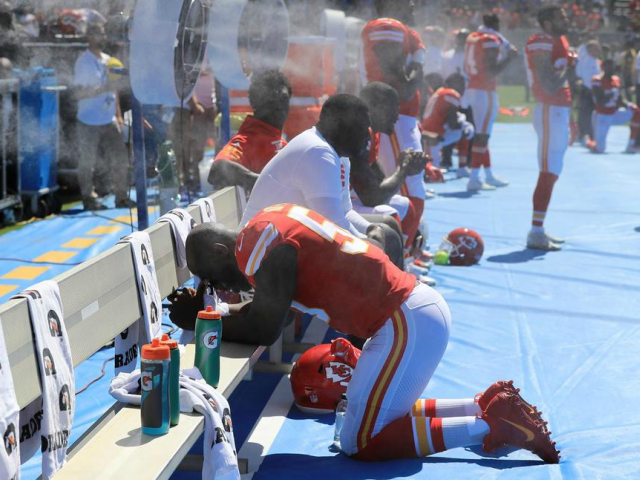 The NFL-styled protests are appearing in high schools across the country. Already kids at a Chicago suburban high school took a knee during the national anthem on Thursday. And last year a high school in Cincinnati, Ohio, was criticized for allowing student to kneel during the anthem.